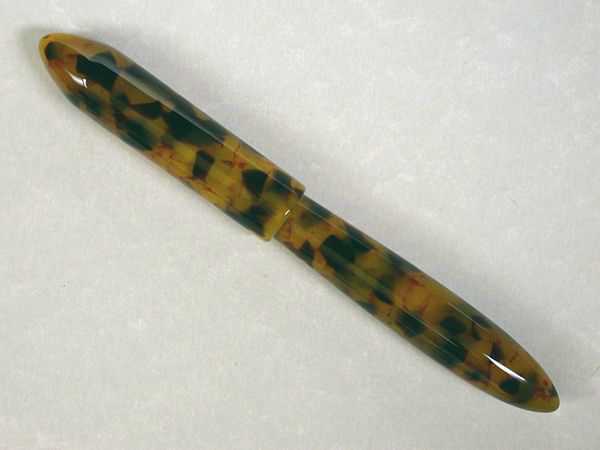 Nanga Custom Clipless Roller-ball Pen - in Tortoise Shell Acrylic. If you are familiar with my pens, then you probably know I derive the names I use from Wikipedia's "list of the worlds tallest mountain peaks". This pen follows in that same tradition by being named after the Nanga Parbat mountain peak. The name "Nanga Parbat" means "Naked Mountain" with Nanga specifically meaning "naked". Since this pen appears to be absent or "naked" of any barrel threads, I thought Nanga would be a very appropriate name for the style. If you wish to read more about the Nanga Parbat mountain peak or about any of the other pen names, you can read them on my Pen Names Page. The Nanga has a capped length of about 6", and 5 1/4" uncapped. The unique forward mounted threads on the Nanga allow it to have a nice free flowing style. The smooth transition across the front-section and barrel allows it to have a smooth and graceful flow along the entire length of the barrel. The design also allows some flexibility in the diameters so it could be adjusted to fit small or large hands. As with most other JEB's PENs, the Nanga can be ordered in any of the materials shown or your material of choice. 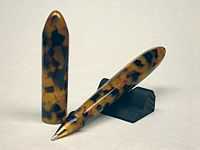 The pen includes a steel Meister nib in your choice of finish and tip size. The standard pen uses a Cartridge/Converter inking system, but can be upgraded to a piston or button filler. If you like to use the pen as an eyedropper, you can order it with a special rubber o-ring that seals the section to the barrel so it can be filled directly with ink. The larger #6 nib is the best size for the Loa, but it could be ordered with a #5 if desired. Nib finishes available for STEEL nibs are: 2-tone, polished steel, Black Oxide (#6 only), or Ruthenium (#5 only). Current tip sizes are x-fine, fine, medium, broad, and two italics (1.1 both; 1.4 for #5 only, and 1.5 for #6 only). 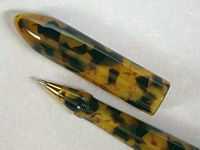 14 & 18K Gold nibs are also available as a special order. The Nanga is another pen style that allows for a few upgrades and options. You could add metal accent bands to the base of the cap, or add a HIDDEN RING clip (see the Tortoise Shell). The accent bands are available in several finishes (24k gold, nickel or Rhodium, and come in a variety of diameters with widths from 1 to 4mm (n 1mm increments). As stated above, you can also upgrade your pen with a 14k or 18k gold nib. Inking system upgrades... Because of the style of the barrel, it's not very conducive to adding a blind-cap for a piston or button filler. So the only upgrade option available for the Nanga would be adding an o-ring so it could be used as an eyedropper. 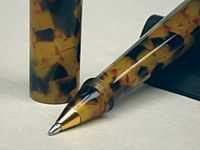 I also offer a variety of hand-made Pen Props and Pen Buttons. You can order a Pen Prop in a material to match your pen, or any one of the wooden styles made in a variety of stained or dyed colors. The Pen Buttons are available for any of the clipless pens. This pen uses the same material as the other Tortoise Shell acrylic pens, but this one is a ROLLER-BALL similar to the Abalone MAGNUM Roller-ball. 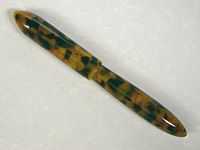 However while the Abalone pen uses a PILOT G2 refill, this one uses a PARKER STYLE refill. One other difference between the two (and from the fountain pen as well) is that it doesn't require a separate section. Here, the barrel and section are ONE PIECE made with a single piece of acrylic. To replace the ink refill, you simply unscrew the small nose-cone at the front above the threads (this couldn't be done on the larger MAGNUM as the pen blanks aren't long enough). The one piece option allows an uninterupted pattern in the material along the entire length of the barrel. This would allow more freedom in choosing materials, as you could choose materials with a more dramatic pattern without having to worring about how it will look at the break point of the section & barrel joint. 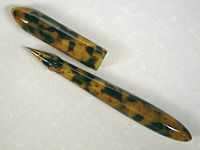 This material is an Acrylic Acetate in a crushed pattern called "Tortoise Shell". The Tortoise Shell acrylic is probably one of the most recognizable material used in many products in years past (pens and eye glasses were the most popular items made), and the pattern is still just as popular today as it in years past. If you haven't guessed already, the blend of black and honey gold chips in the material is made to mimic the shell of a tortoise. Tortoise shells were actually used prior to and in the very early days of acrylics, but the use of actual tortoise shells was eventually banned. Color / Material: Tortoise Shell Acrylic Acetate. Length: Capped = 5.77" / Uncapped = 5.0" / Cap = 2.74". Diameter: Barrel max = .62" / Cap = .65". Refill System: Parker Style Roller-ball. For pricing, shipping and warranty information see HERE.